Instant Queue Special - "The Searchers"
Former Confederate soldier Ethan Edwards (John Wayne) returns home from the Civil War with bags of money and buckets of bitterness. Just as he's settling into civilian life, a band of Comanche Indians come through, slaughtering most of his family and capturing his young niece, Debbie. Ethan and his posse, including a half Cherokee boy named Martin (Jeffrey Hunter) whom Ethan rescued years ago, set off on a journey to hunt down the Comanche and reclaim Debbie. But as the years drag on and their numbers dwindle, the reasoning behind Ethan's search become murky and it becomes clear that Martin is Debbie's only real hope of surviving. "The Searchers" is one of those movies that seemingly every film aficionado calls a classic and some I know have even put it into the discussion of "best Western ever." Personally I'm not all that impressed. (To be fair though, I'm often less than impressed with many of the classics.) There's definitely some strong material here. It's hard to ever say anything negative about John Wayne, partly because he's awesome and partly because I'm still a little afraid of him even though he's been dead for 31 years. And the rather straight forward handling of the film's inherent racial tones is outstanding. Still, though, these qualities don't cover up the fact that "The Searchers" is a nightmare in terms of character and plot development. The story jumps rapidly and crudely from scene-to-scene and the characters are poorly written and extremely one dimensional. It's also a bit on the boring side with Ethan and Martin basically doing the exact same thing for 119 minutes. There's no question that many of the classics would be absolutely butchered if they were made today. Imagine "The French Connection" as directed by Michael Bay. Blerg. But it would be foolish to stop there and not admit that some of the classics could use a dose of modern filmmaking. 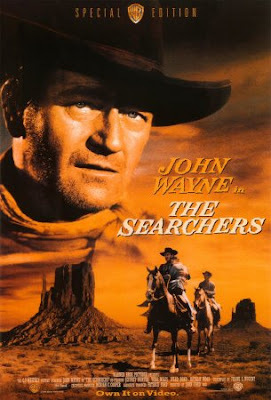 With a touch of additional storytelling, some character development, and a release date during an era in which Westerns are not a dime a dozen, "The Searchers" would be an award worthy film. As it is, it's a solid "not bad" in my book.